With Givenchy making it huge and Chanel giving it a softer ‘edge’, a face masked with color or jewels remains on our agenda over the last couple of seasons. If you are still looking for the minimalist version of this dramatic look, try the Uma Wang warrior makeup that complemented the designer’s abstract and fluid silhouettes at her Milan Fashion Week SS17 show. Inspired by North African desert cultures, the look simplifies the intricate traditional face painting into a black vertical forehead strip extending into a slim line dissecting the face up to the nostril level. Black makeup and face painting is mainstream lately and the look makeup artist Valentina Rodella came up with is devoid of any punkish vibes designers Marc Jacobs or Gareth Pugh would instill into it. 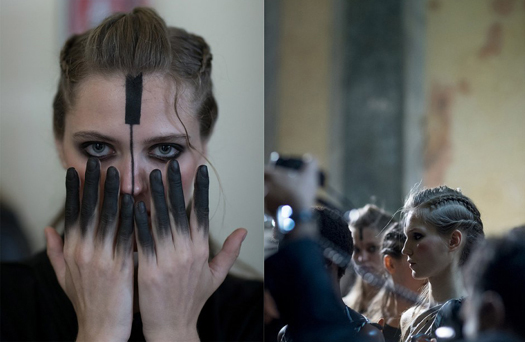 To make the Egyptian/Sudanese influence crystal clear, Valentina dipped the models’ fingers into matching black paint. Rick Owens’ wife and muse Michele Lamy is infamous for blackening her finger tips with ink as a nod to this oriental unconventional beauty. Cross-cultural and cross-continental is making waves right now. Uma Wang, a Chinese designer and Central St Martins’ graduate who has been praised by Franca Sozzani and many more influential fashion editors, resorted this season to the mysterious allure of Africa. The look is fierce and serene at the same time. Valentina started with eye makeup and progressed into her cool and linear face painting. 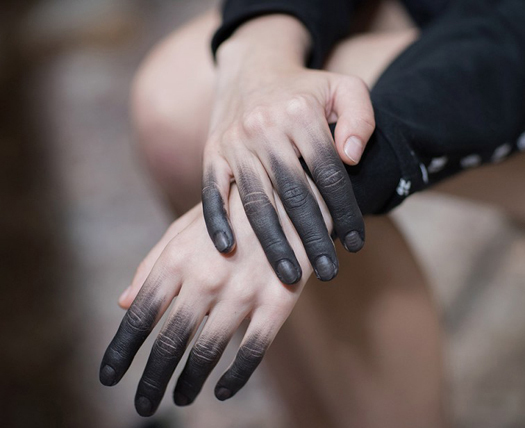 If interested in the dip-dyed fingers effect, the surest path to go is to use a black water-based acrylic paint that is washable and removable. Mara Hoffman and Thom Brown have done it a few seasons ago, but now we really love this smooth gradient into the model’s natural skin color. It’s just a cool smudge, not a thick layer of paint, as in the previous cases. With Uma, we see in front of us an urban tribe, one that transcends the desert and lands the cityscape. The look requires you to be eclectic with smudge and precise with lines in order to make the most of it!